Sleep in the comfort and luxury with luxurious and high quality black flat sheets. Our luxurious flat sheet in black colour is made from 100% Egyptian cotton and is epitome of luxury. 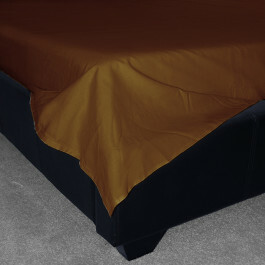 With a 200 thread count, our black flat sheets is extremely soft, smooth and highly breathable. This black flat sheet will add a touch of elegance to your bedroom and will go perfectly well with both modern and traditional types of decor. Available in ample of sizes, our luxurious black flat sheet will surely give you a comfortable and tranquil sleep. This flat sheet can be machine washable at 40 degree Celsius and is highly durable. Improve the attire of your bed with our exclusive range of high quality flat sheets. Our luxurious flat sheets are made from 100% Egyptian cotton and polycotton that are extremely soft and smooth to give you a peaceful and soothing night's sleep. You will surely feel pampered lying on our flat sheets. Available in various thread counts you will enjoy its softness and luxury. Apart from providing you with a blissful resting experience, our flat sheets enhance the beauty of your bedroom too. Available in a broad array of colours, you can easily match them with your existing decor. 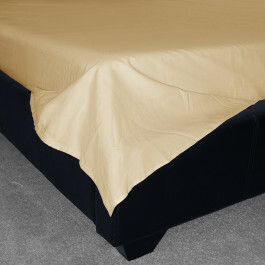 Our flat sheets are highly durable, handy and can be machine washed to look it fresh and clean. Now, Splash hues of colours on your bed with our exclusive range of flat sheets and give yourself a relaxed and cosy good night sleep.